A water pump is a machine used to increase the pressure of water in order to move it from one point to another. Modern water pumps are used throughout the world to supply water for municipal, industrial, agricultural, and residential uses. Water pumps also are used to move wastewater in sewage treatment plants. Modern water pumps most often are driven by electricity, but other power sources also are used—for example, diesel or gasoline engines. In some remote areas, such as desert regions, solar panels may be used to supply power to small pumps. Reciprocating pumps move water by means of a piston that moves back and forth in a cylinder with valves to help regulate the flow direction (intake and output) of the water. As it moves in one direction, the piston expands the room inside the cylinder and creates a partial vacuum that draws water into the cylinder. An intake valve closes, trapping the water that was drawn into the cylinder; then an output valve opens concurrently with the piston reversing direction, which forces the water out at a higher pressure than when it entered the pump. Electric-powered reciprocating pumps most often are double-acting, meaning that the pumping action takes place on both sides of the piston. 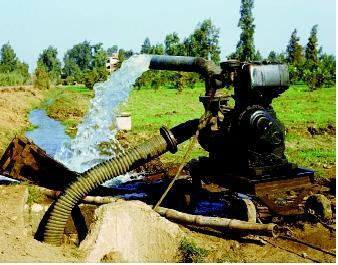 Although most modern pumps are electrically powered, this pump in an Egyptian farm field is driven by an engine. The pump is mounted on wheels so that it can be moved from one location to another along irrigation channels. A centrifugal pump is the most common type of rotary pump. It possesses rotating blades—called impellers—that impart energy to water as they rotate. The action is similar to that seen in a household blender; when a blender is filled with water and turned on, its rotating blades cause the liquid to swirl. The impellers are housed in a casing. Water typically enters the casing near the shaft of the spinning impeller. The blades of the impeller are immersed in the water to be pumped. As the impeller turns, water is swept out from near the axis of the impeller toward a peripheral outlet. Some centrifugal pumps employ diffusers. Typically, diffusers are stationary blades that sit outside and near the rim of the impellers. Diffusers help smooth the outward flow of water expelled by the inner impellers, thus increasing the efficiency of the pump. When high pressures are needed (as in the case of a deep well, for instance) a number of impellers may be used in series, and the diffusers following each impeller may contain guide vanes to gradually reduce the liquid velocity. For lower-pressure pumps, the diffuser generally is a spiral passage, known as a volute, with its cross-sectional area increasing gradually to reduce the velocity efficiently. Centrifugal pumps come in a variety of sizes and shapes, and are used in applications big and small: for pumping water from a well; for irrigation ; in wastewater treatment plants; and to circulate the water in whirlpools, to name just a few applications. High-capacity pumps can be used to deliver water from a supply source and to move excess water. When the River Somme in northern France flooded in May 2001, several giant pumps were brought from the Netherlands to deliver floodwaters into the sea. Each pump could deliver about 15,000 cubic meters of water per hour (or about 65,000 gallons per minute). Although the pump is not shown in this photograph, the large volume of water it discharges is evident. lakes and reservoirs , and for irrigation; they also are employed extensively as deep-well pumps, which sometimes extend hundreds of meters below the ground surface. The jet pump is fundamentally different than reciprocating or rotating pumps: namely, it has no moving parts. Jet pumps are used extensively in both shallow and deep wells. Jet pumps employ two pipes: the usual main well pipe that carries water up from the subsurface, and a pressure pipe. A standard centrifugal pump operates from the surface. The output of the centrifugal pump is split, and roughly three-fourths of the water pumped to the surface is sent back down through the pressure pipe where the water is pressurized by moving through a small diameter nozzle. Below ground, where the high-pressure pipe meets the well pipe, the pressurized water enters an enlarged chamber in the pipe. When the water moves into the chamber, the pressure is reduced to below the surrounding area, and water from the well is drawn upwards into the well pipe. Both centrifugal and jet pumps are used to pump water from shallow wells (wells that are 7 meters [25 feet] or less in depth). Jet, centrifugal, and turbine pumps are all used for deep-well applications (from just over 7 meters [25 feet] to over 100 meters [several hundred feet] deep). Centrifugal and turbine pumps are placed deep in the well. Sometimes a surface motor using a shaft that runs down the well to the pump turns them. In contrast, submersible pumps have both the motor and pump below the water level in the well, powered through an insulated wire running to the surface. Approximately 60 percent of domestic self-supply (i.e., home) wells in the United States use electric submersible pumps. SEE ALSO Pumps, Traditional ; Uses of Water ; Wells and Well Drilling. Stewart, Harry L. Pumps. Indianapolis, IN: T. Audel, 1977. Centripetal Pump Basics. Pumpline.com . <http://www.pumpline.com/academia.htm> . Deep Subjects: Wells and Ground Water. New England Region, U.S. EnvironmentalProtection Agency. <http://www.epa.gov/region01/students/pdfs/ww_well.pdf> . How to Talk Ground Water—Topic No. 8, Equipment Used in Wells. American GroundWater Trust. <http://www.agwt.org/natdlr8.htm> . Pumps and Pumphouses: Pumps. Ministry of Water, Land, and Air Protection, BritishColumbia. <http://wlapwww.gov.bc.ca/wat/gws/gwdocs/prac_info/GROUND16.html> . Photographs showing different applications of modern water pumps can be found in the following entries of this encyclopedia. Although the types of pumps are not known, it appears that most are powered by electricity, whereas the irrigation pump along the Nile River ("International Cooperation") is being driven by an engine. "Careers in Water Resources Engineering"
* Photographs of the types of pumps discussed in this entry can be found at <http://www.animatedsoftware.com/pumpglos/> .